Considering a Big Chop? 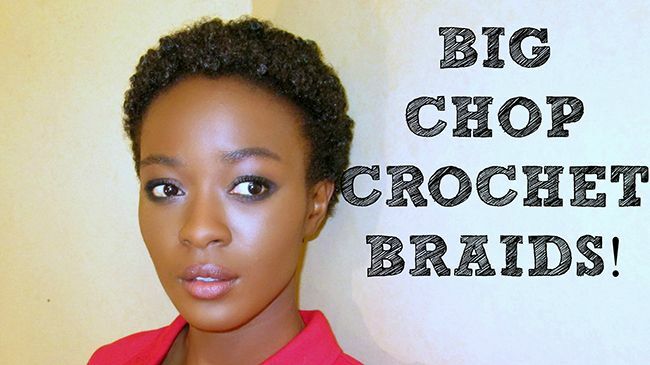 Try a Crochet TWA First! “My face is too fat” and “My head is too big” are all things we hear from women who are hesitant to big chop or get a haircut. NaturallyCurly is all about equipping women with educational tools that allow them to make educated choices and exercise their options, so when I saw Pure Estrogen’s DIY big chop crochet tutorial I was more than excited to share. Women have been faking length, texture, and locs for years so why not fake a big chop? Most of the DIY short-haired wigs on YouTube are with curly and wavy textures and now here’s one with afro-textured hair. Not quite sure or ready to big chop? Make your own wig! Rock a texture more similar to your curl pattern. Of course you will never be sure of your curl pattern until you sever the relaxed or heat damaged ends, but a 4a is far more similar to a 4c than a 3a. Gives you an idea of how your hair will look if it is prone to major shrinkage. This is important because oftentimes the main reason people transition is to avoid the drastic shock of a shorter length. Everyone's hair grows differently; it either grows out or down and you never know until you make that cut. Thoroughly cleanse your scalp with a gentle, clarifying shampoo, and follow up with a deep conditioning treatment, especially if you do not wash your hair weekly. Make sure your hair has completely dried before putting on the wig. You do not want to create an environment for fungus and other bacteria. Cornrow your hair with a rich moisturizer and/or butter to prevent brittleness that usually results in breakage. Remove the wig nightly or when at home to ensure that your scalp is able to breathe.